When you think of March, do you think about March Madness or do you start dreaming about your garden? In my house, March madness is very alive and well with the final four approaching. (Basketball lingo that I learn from the five men in my household.) For me the color orange represents pumpkins not a rubber ball called a basketball. But for my children, the color orange means B-ball, Ty Lawson (North Carolina), Tyler Hansborough (North Carolina), and Hasheem Thabeet (U Conn), and A.J. Price (U Conn). Are you impressed that I know this. Well, don’t be. I had to ask. As they root for their teams on their bracket sheets, No one. I repeat. No one is excited about my garden except Moi. Well, okay, they are never excited about my seedlings. Honestly, they dread my garden since it means work for them. They even offered to stop eating the strawberries if I would not ask them for help anymore. Sheesh. What’s a gardener supposed to do? As they watched such teams as North Carolina to their beloved Ohio State play, I was busy ordering seeds. 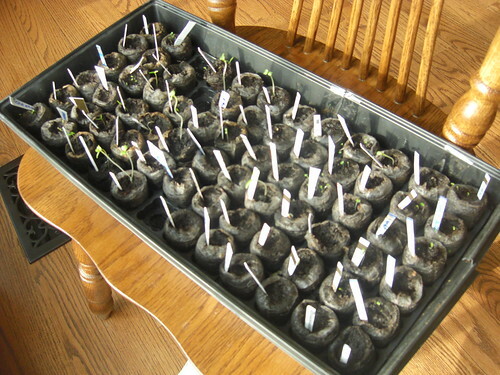 My favorite source of heirloom organic seeds is Heirloom seeds. Each year I expand my flower and vegetable palate in the garden. As I planned my strategy, like the college basketball coaches subbing in the stronger varieties and benching the not so performing ones, I made my list of what plants I wanted to grow. One by one I went through the Heirloom seeds’ vegetable categories looking at their description and assessing my chances for success in my garden. I think I sweat more than the players in those games. Crucial decisions. Timing. Teamwork. All vital issues to consider when making an all-star garden line-up. we are temporarily suspending taking any additional orders for Spring shipment. I wasn’t sure how to rebound? What would be my next play? I have been ordering from them for three years. Where was I going to find heirloom, organic seeds? A good coach knows how to take a bump in the road and turn it to his advantage. I was one with Roy Williams, North Carolina’s coach, who my kids think is going to win the college championship. He told me to pull it together and get back on the court. I replied. “You’re right, Roy. It is only a temporary set-back.” Taking his advice, I took a deep breath and plunged in. After an hour or so of searching of which seed companies I wanted to order from, I found Baker Creek Heirloom Seeds. With gazillion rare seeds to pick from, I was the kid who took the final 3 point shot in the game. With two full trays of seedlings growing, my biggest problem is where am I going to put all these plants? I am eying another part in my lawn for more plants, which means more work for my kids. You know the saying, no pain, no gain? If you want to win the championship, then you have to put in the effort. Saving the Earth is worth the effort. I know this summer, by growing my own veggies, I am lowering my carbon footprint, eating organic and healthy, and getting immense pleasure out of gardening. So, who is bring home the trophy? what plans do you have for your garden? which seeds did you absolutely love last year? which seeds were you disappointed with? what does growing your own garden mean to you? which flowers did you grow in your garden as well? In essence, what is your game plan?